Interested in finding out more about your heritage? Whether it is about your family or where you live start your search through the many free online and physical resources held by South Lanarkshire Libraries to use in the library or from home. All of our libraries offer free wifi or, if you don't have access to a mobile phone or tablet, use one of the bookable ActiveIT PCs. Remember you need to be a library member so join now. Discover your family's story by searching the billions of records held on the Ancestry website (library edition), a subscription site which is free to use in your local library, or the International Genealogy Index (IGI), which you can use at home. 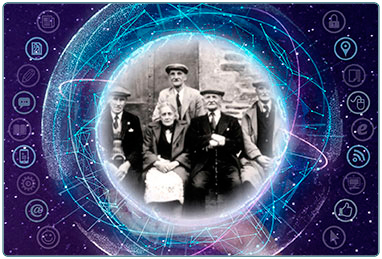 For access to local archives information South Lanarkshire Council offer a Family history service. Full details of what they offer is available on their Family history and genealogy page as well as comprehensive guidance on how to get started. If you would like some help getting started ask the library staff or, for a small charge, sign up for one of our Family History courses. SLLC libraries have joined with SCRAN (Scottish Cultural Resources Access Network) to offer free digital access to over 370,000 photographs, moving images and sounds, from museums, galleries, archives and the media. All you need is your library membership number. Get started by visiting the SCRAN website. You can also access the Low Parks Museum Online Collection which comprises over 13,500 images and discover the unique online collection at Cameronians (Scottish Rifles). We can help you with your research in both our Libraries and Museum services. Why not visit Low Parks Museum to enjoy the collections in person? Discover what it was like to live and work in Lanarkshire in years gone by as well as experiencing the Cameronians (Scottish Rifles) exhibition first hand. If you wish to enquire about museum collections or Cameronians (Scottish Rifles) records please go to museum enquiries.